Aluminum: Aluminum is the most common and cost effective material for the socket interior. Copper: Copper is an alternative to Aluminum where the fixture is exposed to weather. Porch fixtures should use sockets with copper screw shell and porcelain body. Brass plated: Brass plated shells are similar to the brass shells in appearance with a cheaper price. 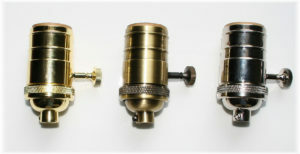 A brass plated shell comes with similar finishes to the solid brass shell. 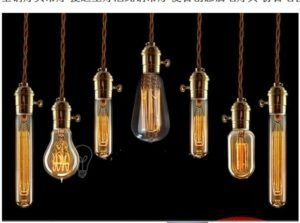 These gorgeous vintage light bulbs create a beautiful ambiance – the old fashioned style filaments glowing with warm light, just like the originals invented by Thomas Edison. The old style light bulbs are very versatile and can be used with a Antique Brass Sockets or look stunning just on their own – they can be used as the main light in a room or can simply be decorative.